This one is for both the Hero Arts "a stamp for all season's challenge and the CAS black and white plus one. Ink: Hero Arts Neon Pink. Thanks for taking the time and please feel free to leave a comment! Hello Kim! I love how you combine the graphic sentiment with the pretty elements! This is so well done! So glad that you join the fun with us at CAS-ual Fridays! These colors are phenomenal - I love them! Thanks so much for playing with us at CAS-ual Fridays! We're so glad you did! 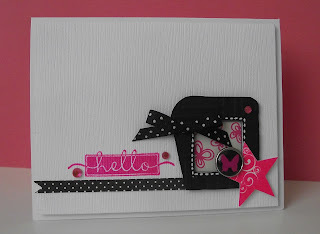 Love all the lovely details of your card...and the color with the black and white...one of MY very favorite:)!! Thanks for sharing your creativity this week at CAS-ual Fridays:)! !